As a keystone species, bees are fundamentally important to all terrestrial life, yet information about them is slanted to support their agricultural exploitation. By contrast, this course looks at the ecology of wild bees. Three richly illustrated lectures cover the complex world of bees and their interconnectedness to everything around them. The first lecture reports on observations made at Cape Point Nature Reserve, specifically on the impact of recent fires on the Cape honeybee. 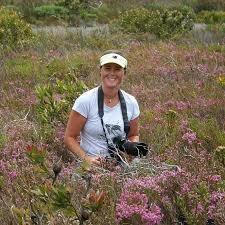 The second lecture presents research on one nest in Noordhoek over a four-month period. It focuses on the daily goings-on within a wild colony. The final lecture discusses the solitary bees of the South Peninsula. Some blow nectar bubbles into the wind; others mate on just one type of flower, use leaves to line their nests, or close their entrance holes with cellophane. 1. Are our bees going up in smoke? Goulson, D. 2015. A Sting in the Tale. New York: Picador. Seeley, T.D. 2016. Following the Wild Bees. Princeton: Princeton University Press. Tautz, J. 2011. The Buzz about Bees. London: Springer. Jenny Cullinan moved to the Cape six years ago and has been involved with wild bee research in Cape Point Nature Reserve (TMNP) and various other biomes for the past five years. Her research is self-funded and is totally focused on the ecology of wild bees; a long and thoughtful study of the bees’ home and of all the living world around them and of the consequences of our actions in it. She is also an artist (sculptor), using her art to raise awareness about bees.